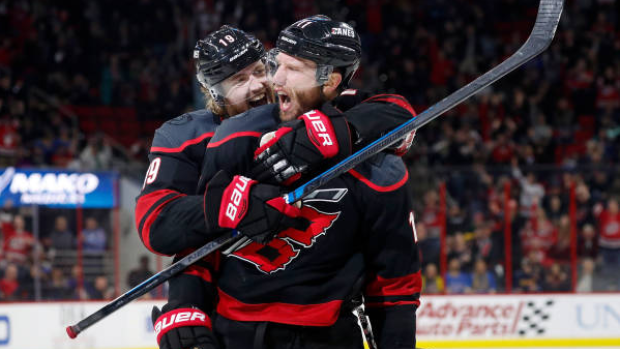 Carolina Hurricanes defenceman Calvin de Haan returned from injury to practice on Monday, with optimism on the team's playoff chances. De Haan, who's been out since March 11 after taking a stick to the eye from Colorado Avalanche forward Alexander Kerfoot, told Chip Alexander of the Raleigh News and Observer that the team cannot only hold their playoff spot, but continue to rise in the standings over their final 11 games. The Hurricanes are currently closer to falling out of a playoff spot than reaching a top two spot in the Metropolitan Division. Entering play Tuesday, Carolina occupies the top wild-card spot with a one- point lead over the Columbus Blue Jackets for the final spot and a four-point lead over the Montreal Canadiens, who sit outside the playoff picture. The Hurricanes are six points back both the New York Islanders and Washington Capitals for a spot with home-ice advantage, with the Pittsburgh Penguins also three points ahead of them. Since the All-Star break, the Hurricanes have the fourth-best record in the NHL at 15-5-1. De Haan, who returned to practice for the first since the injury on Monday sporting a full-face shield, does not have a timeline for his return to the ice. He said the stick to the eye left him "pretty much blind for 48 hours." “They’re trying to keep the eye from moving, to let it heal,” he explained. “That’s why I’m using industrial-strength dilating drops. It’s still a little blurry and probably not safe to be going full speed in a hockey game right now. The Hurricanes can close in on third place in the Metropolitan Division with a win over the Penguins on Tuesday night.